What Would It Be Like to Live on Alien Planet Kepler-186f? What would living on another planet, outside of our solar system be like? This artist's illustration imagines what it could be like to live on the planet Kepler-186f. In recent years, NASA's Kepler space telescope and other observatories have discovered more than 1,800 extra-solar planets, with thousands of additional "candidate" planets awaiting confirmation. Current technology is nowhere near able to allow quick intergalactic travel, but if you somehow wound up on an Earth-size alien world, what would you experience? Last year, scientists announced the discovery of Kepler-186f — the first Earth-size exoplanet found in its star's habitable zone, the region of space in a planetary system where liquid water (and, therefore, life) could exist. 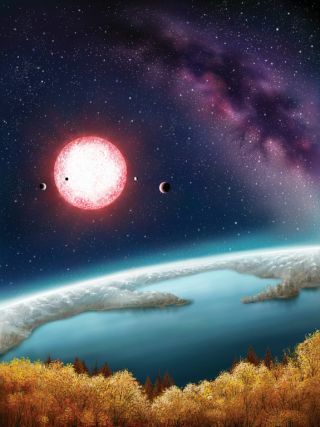 At last humans are able to make educated guesses about what living on alien worlds might be like. See what we know about alien planet Kepler-186f. If you were standing on the surface of the exoplanet, Kepler-186 would appear about 30 percent larger than the sun appears from Earth, but Kepler-186f would receive slightly less light from its star than Earth does from the sun. So, at high noon on a sunny day on Kepler-186f, Kepler-186 would look comparable to the sun an hour before sunset on Earth, Quintana said. It's unclear what sunrises and sunsets would look like on Kepler-186f — that would depend on the planet's atmosphere. If the exoplanet had an Earth-like atmosphere, its sunrises and sunsets would be more "enhanced" than Earth's because there would be overall less blue light coming from the star, Quintana said. Given the unknowns around Kepler-186f's atmosphere, it's also unclear what kind of weather or temperatures you'd experience while on the planet. Kepler-186f's surface features are also a mystery. "We only know that it is at the right distance [from its star] to allow the existence of water in liquid form," Quintana said. Measurements suggest that Kepler-186f is 11 percent larger than Earth, though it's not possible to pinpoint the exoplanet's gravity without knowing its composition. If the exoplanet were "rocky" like Earth (made up of one-third iron and two-thirds silicate rock, water and ice), its gravity would be similar to Earth's, according to calculations by researchers. Whereas Earth has a 365-day year, Kepler-186f takes just 130 Earth days to orbit its star. The exoplanet is expected to have a nearly circular orbit around Kepler-186, so you probably wouldn't experience seasonal temperature differences due to the planet's distance from its star. But, like Earth, it may have seasons due to an axial tilt, which affects how much light different parts of the planet receive throughout the year. Quintana and her team aren't able to ascertain Kepler-186f's day length, or if the planet is tidally locked with its star (wherein one side of the planet faces the star at all times). The Kepler-186 system contains four other planets, all of which are closer to their host star than Kepler-186f is to that same sun. These inner planets are all tidally locked with Kepler-186, but models suggest Kepler-186f is far enough from its star that it might not be tidally locked with it. From the surface of Kepler-186f, the star's inner planets would be difficult to see. Kepler-186e could be visible by eye for a short time, such as during sunset, and it would look like a bright star, similar to what Venus looks like from Earth, Quintana said. And if you wanted to try to contact people back home on Earth, don't hold your breath — a message sent from Kepler-186f would take almost 500 years to get to Earth. Editor's Note: This story is the final installment of Space.com's 12-part series "Living on Other Planets: What It Would Be Like" to see what an astronaut would see on other planets and moons of our solar system and beyond.